The US NTSB determined that the probable cause of this Airbus A300-600F accident was the flight crew's continuation of an unstabilized approach and their failure to monitor the aircraft's altitude during the approach, which led to an inadvertent descent below the minimum approach altitude and subsequently into terrain. During takeoff, as the aircraft was accelerating at 40 knots, it pitched up and its tail touched the ground violently. The crew abandoned the takeoff and returned to the parking area. The aircraft was completely destroyed on impact with the sea. The pilot flying applied forward pressure on the control column but did not increase power when the stall-warning system activated during takeoff. The airplane descended into water soon thereafter. The controlled-flight-into-terrain (CFIT) accident occurred on a dark night with limited external visual references available for the flight crew. During the landing flare, the rudder control inputs were not effective in correcting for a slight crab. The aircraft landed and taxied to the gate. After shutdown, it was discovered that the aircraft rudder was missing. Small pieces of the rudder were still attached to the vertical stabilizer. The A310 ran down the runway, overran the runway threshold and collided with barriers, broke apart and burst into flames. On 25 March 2008 an Airbus A310 being operated by Sudan Airways on a passenger flight from Port Sudan to Khartoum overran the runway after a late night touchdown at destination in normal visibility off a non precision approach to runway 36. A fire became evident once the aircraft had stopped and this subsequently burned out of control and destroyed the aircraft. 30 of the 214 occupants died because of the fire and related smoke but no record of the extent of injuries to the survivors was available to the Investigation. On approach the captain inadvertently selected the parking brake to ON after the first officer had called for full flap. The application of the parking brake was not detected prior to touchdown. All four main landing gear tyres deflated on landing. While in the cruise, with the autopilot and autothrust systems engaged, a failure of the electrical system occurred which caused numerous aircraft systems to become degraded or inoperative. Some of the more significant effects were that the A319 could only be flown manually, all the aircraft’s radios became inoperative and the Captain’s electronic flight instrument displays blanked. Attempts by the flight crew to reconfigure the electrical system proved ineffective and the aircraft systems remained in a significantly degraded condition for the remainder of the flight, making operation of the aircraft considerably more difficult. The flight crew were unable to contact air traffic control for the rest of the flight. The aircraft landed uneventfully with the radios and several other systems still inoperative. On 19 December 2010 the Airbus A319 coming from Vienna, Austria, was on approach to Köln/Bonn Airport, Germany. Turning on to the base leg the two pilots noticed an abnormal smell. A short time later during intercept of the extended centre line, both pilots noticed an adverse effect on their physical and cognitive performance. They donned their oxygen masks and declared emergency. The PIC remained able to steer the airplane. The co-pilot felt he could no longer perform his tasks in the cockpit without restrictions. After the landing and having reached the parking position, both pilots sought medical treatment. Whereas the PIC could resume his duties after four days, the co-pilot remained unfit to fly until 10 July 2011. The technical inspection of the aircraft did not reveal any indication of a technical malfunction. An Airbus A319 narrowly escaped disaster at the end of an unstabilized, hurried VMC approach. While landing on a short runway the aircraft touched down just beyond the end of the marked touchdown zone with low autobrake selected. Manual wheel braking commenced shortly after mainwheel touchdown. At a groundspeed of around 70 kt the brakes ceased operating, for about 17 seconds. A pronounced dip in the runway surface initially prevented the pilots from seeing the runway end. When it became apparent to the Captain that it would not be possible to stop before the end of the runway, he deliberately did not select alternate braking, as this would have caused loss of nosewheel steering, but instead used nosewheel steering to turn the aircraft sharply to the right. The aircraft skidded sideways and came to a halt with its nosewheels off the runway, shortly before the end of the paved surface and the start of a steep down slope. An unusual smell was noticed soon after takeoff, the source of which could not be determined. The flight crew donned their oxygen masks and carried out the appropriate actions to deal with the situation, while arranging with ATC for a return to Heathrow. Subsequent investigation revealed that hydraulic fluid leaking from a hydraulic actuator had been ingested into the air conditioning system. Following appropriate maintenance action, the aircraft was returned to service and no recurrence has been reported. The report said that spatial disorientation likely was involved in the flight crewâ€™s controlled flight into terrain (CFIT) during an attempted go-around. 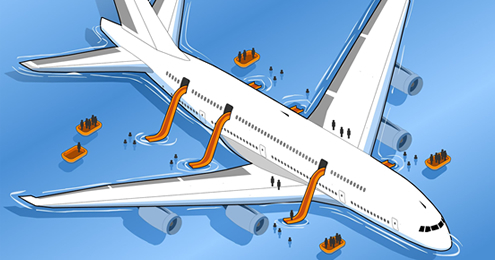 The ground-proximity warning system generated nine warnings before the aircraft struck the sea. During a go-around in bad weather conditions, The Airbus A320 stalled in turn. The aircraft was completely destroyed due to impact with the water. After receiving taxi clearance from Air Traffic Control, the A320 started moving under its own power. Shortly afterwards it collided with the tractor that had just performed the pushback, damaging the right engine and the tractor. The aeroplane did not respond to the pilots' commands on the controls to pitch up the aircraft and to reduce the vertical speed on the flare, causing the aircraft to impact against the threshold of the runway in a slight nose-down attitude. Upon impact, the nose landing gear collapsed, but the aircraft remained within the runway and stopped after 1,100 meters of landing run with all four main gear tires burst. An emergency evacuation was carried out. A passenger was a seriously injured and several other occupants received some bruises and injuries produced during the evacuation of the aircraft. The internal structural damages of the airframe were beyond economically viable repair and the aircraft was written off. The aircraft landed heavily, causing substantial damage to the aircraft’s main landing gear. It touched down with a high rate of descent, following a late initiation of the flare by the co-pilot, who was undergoing line training. On a flight from Alexandria, Egypt to Addis Abeba, Ethiopia, the crew carried out two approaches using the Addis Abeba VOR and associated DME. On the second approach the aircraft crossed over a ridge of high ground in IMC and came within 56 ft of terrain at a location 5 nm to the northeast of the airport. As the aircraft crossed the ridge the crew, alerted a few seconds earlier by a radio altimeter height callout, carried out a go-around; at the same time the EGPWS generated a â€˜TOO LOW TERRAINâ€™ aural alert. The investigation determined that the antenna of the ADS VOR had suffered water ingress and was not functioning correctly. The correct maintenance procedures for the ADS VOR/DME and its associated monitoring equipment were not followed. The aircraft received erroneous information from the ADS VOR which was fed to the flight deck VOR display, the FMS, the navigation displays and the EGPWS computer with its associated Terrain Awareness Display (TAD). On touchdwon, after a normal ILS approach, the normal braking and alternate braking system failed. The captain elected to turn the aircraft through some 90Â° to the right where the aircraft ran into a low earth embankment. The nose gear collapsed while the engines made contact with the embankment, bringing the aircraft to a stop. The crew were carrying out a manually flown ILS approach without the use of flight directors or autothrust. At 530 ft agl the aircraft was well above the normal 3Âº glideslope. The glideslope was not regained until shortly before landing, and by then the speed was below approach speed (VAPP) and the descent rate was high. During the flare, full back sidestick was applied and the aircraft bounced after touching down in a high pitch attitude; the second touchdown was also in a high pitch attitude. Post flight inspection confirmed that the aircraft tail had struck the ground on landing. The crew judged that they were too high to carry out a safe landing from the ILS approach and requested permission from ATC to carry out a visual approach. The aircraft then flew a right descending orbit and a visual circuit, from which it landed. Upon landing, the crew were advised by ATC that they had, in fact, landed at the wrong airport. The aircraft was in the cruise at FL340 when it encountered an area of severe turbulence and hail. Some of the flight deck windows became crazed and other areas of the airframe suffered extensive damage although this was not apparent to the crew. At approximately 140 feet AGL, on final approach to Runway 24R with full flaps selected, the aircraft experienced roll oscillations. The flight crew levelled the wings and the aircraft touched down firmly. During the approach, the aircraft had accumulated mixed ice on areas of the wing and the leading edge of the horizontal stabilizer that are not protected by antiice systems. A scheduled A330 passenger flight from Rio de Janeiro, Brazil to Paris, France entered an aerodynamic stall from which it did not recover and crashed into the Atlantic Ocean killing all 228 passengers, aircrew and cabin crew aboard the aircraft. On 19 January 2013, an Airbus A330-300 on a passenger flight from Orlando (USA) to Manchester (UK) with an additional heavy crew member present on the flight deck for take offhit birds shortly after making a night take off from runway 35L in VMC and high engine vibration was followed by indications of a total loss of oil pressure from the left hand engine, which was shut down. A MAYDAY was declared and an uneventful return to land was completed. The aircraft made an emergency descent from FL350 and the Captain requested a diversion to Shannon. Due to an error in the takeoff performance calculations, incorrect takeoff speeds were used on departure. On rotation, the aircraft initially failed to become airborne as expected, causing the commander to select TOGA power. The aircraft then became airborne and climbed away safely. Whilst the investigation could not identify the exact source of the error, deficiencies were revealed in the operatorâ€™s procedures for calculating performance using their computerised performance tool. The fire, which started in a windscreen heating system, was observed by pilots while flying 230 Nm SW of Guam. The fire was extinguished by the crew and the aircraft diverted to Guam. An Airbus 330 aircraft, was on a scheduled flight from Toronto (Canada) to Lisbon (Portugal) when the crew noted a fuel imbalance. Shortly after, the crew initiated a diversion from the flight-planned route for a landing at the Lajes Airport, Terceira Island in the Azores..
An A330-300 departed Vancouver, Canada, on a scheduled flight to Calgary, Canada. Shortly after take-off, the Vancouver tower informed the pilots that a substantial amount of smoke or vapour was coming from the number 2 engine. Although the pilots did not receive any abnormal engine indications or cockpit warnings, they declared an emergency and advised that they were returning to Vancouver. The A330 was cruising at 39,000 feet on autopilot near Kagoshima, Japan, when it encountered intense rain and both the captain's and co-pilot's airspeed indicators immediately showed a huge rollback in the plane's forward velocity. With autopilot and automatic-throttle controls disengaged, the cockpit was filled with beeps and bright warning signals indicating various system problems. The Flight crew said the event lasted more than three minutes, but they maintained airspeed, manually flew the most direct route out of the storm and nobody was hurt. Early in the flight the A330 crew received a series of smoke warnings from the aft cargo hold and the Captain elected to return to London Gatwick (UK). The crew carried out the appropriate emergency drills, including the discharge of the fire extinguishers in the aft cargo hold, but the smoke warnings continued. The aircraft landed safely, the crew brought it to a halt on the runway and endeavored to establish the extent of any fire. This produced conflicting evidence and, with smoke warnings continuing, the Captain ordered an emergency evacuation. The passengers all left the aircraft within 90 seconds but two injuries, classed as ‘Serious’, were incurred. Subsequent examination of the aircraft and its systems showed that the smoke warnings had been spurious. Strong turbulence in cruise, momentary loss of control of the flight path by the crew. The Airbus A330 which was flying from Miami, USA to Sao Paulo, Brazil, experienced a loss of primary speed and altitude information while in cruise flight. Initial reports indicated that the Flight crew noted an abrupt drop in indicated outside air temperature, followed by the loss of the Air Data Reference System and disconnections of the autopilot and auto-thrust, along with the loss of speed and altitude information. The Flight crew used backup instruments and primary data was restored in about five minutes. The flight landed at Sao Paulo with no further incident and there were no injuries and damage. On 13 April 2010, a Rolls Royce Trent 700-powered Airbus A330-300 being operated by Hong Kong-based Operator Cathay Pacific on a scheduled passenger flight from Surabaya, Indonesia to Hong Kong experienced difficulties in controlling the thrust from both engines whilst en route and as the initial difficulties worsened, a PAN and then a MAYDAY was declared. A successful high speed landing was subsequently made in normal daylight visibility on runway 07L with asymmetric thrust settings which could not be altered resulting in minor damage to the aircraft and a landing gear fire which prompted an emergency evacuation in which 62 of the 322 occupants sustained minor injuries and one sustained serious injuries. in strong gusting crosswind conditions, the aircraft began to drift to the right of the runway extended centreline. At the moment of touchdown, the aircraft was drifting to the right, its heading was some 10Âº to the left of its track and its roll attitude was approximately 3.5Âº right wing low. These factors resulted in the tyres of the two outer wheels of the right main landing gear making firm contact with the right edge line of the designated runway surface. A serious incident involved an Airbus A340-300 aircraft at Hong Kong International Airport at a time the Flight crew attempted to take-off after making a wrong turn onto a taxiway. On detecting the anomaly, an air traffic controller instructed the pilot to stop rolling and the attempted take-off was aborted in time. There was no other traffic on the taxiway and there was no injury to persons or damage to the aircraft. One hour and nine minutes into the flight, while cruising at flight level 350, the pilots felt an airframe vibration and observed the number 1 engine shut down spontaneously. The report said that a wheel-brake torque rod detached and prevented the left-main gear from extending fully. The aircraft was substantially damaged during the emergency landing at London Heathrow Airport. Seven occupants received minor injuries during evacuation. On 21 August 2008, an Airbus A340-300 on a scheduled passenger flight from Teheran (Iran) to Frankfurt (Germany) collided with a stationary bus with only the driver on board whilst approaching the allocated parking gate in normal daylight visibility. The No 4 engine impacted the bus roof as shown in the photograph below reproduced from the official report. None of the occupants of either the aircraft or the bus were injured. An A340-300 from Caracas (Venezuela) to Paris Charles de Gaulle (France), was enroute at FL350 about 145nm northeast of Point A Pitre (Guadeloupe) in night and instrument meteorological conditions when the Flight crew received an overspeed alert, the autopilot disconnected, the crew observed the indicated airspeeds had increased to 0.88 mach (MMO 0.86 mach) and 304 knots. The aircraft gradually increased its pitch attitude to 11 degrees and climbed with up to 5 000 feet/minute up to FL380, reaching FL380 at 0.66 mach/ 205 KIAS - stall speed was computed at 202 KIAS - before the pitch attitude decreased again and the aircraft returned to normal flight parameters. The flight was continued to Paris and landed safely in Paris about 7.5 hours after the upset. On 27 April 2008 an Airbus A340-300 on a scheduled passenger flight from London (UK) to Nairobi (Kenya) with the First Officer as PF had carried out a night auto ILS approach to Runway 06 with the A/T engaged and been cleared to “land at your own discretion” with visibility reported as 3000 metres and the W/V 050 at 5 kts. The crew stated that they became visual with the runway at a height of between 300 and 200 ft. and at the DH of 200 ft, both pilots had more than the minimum visual reference required and could see “all the approach lights and a good section of runway lights”. The autopilot was disconnected at 100 ft radio altitude and the PF began to flare the aircraft at between 75 and 50 ft radio altitude. The aircraft floated at around 20 ft for a few seconds before it entered an area of fog and the PF lost sight of the right side of the runway and the runway lights. The commander also lost sight of the right side of the runway. During the flare, the aircraft travelled through an area of heavy rain, and visual contact with the runway environment was significantly reduced. There were numerous lightning strikes occurring, particularly at the far end of the runway. The aircraft touched down about 3800 feet down the runway, reverse thrust was selected about 12.8 seconds after landing, and full reverse was selected 16.4 seconds after touchdown. The aircraft was not able to stop on the 9000-foot runway and departed the far end at a groundspeed of about 80 knots. The aircraft stopped in a ravine and caught fire. Within seconds of becoming airborne, the flight crew were informed by ATC that the aircraft had scraped its tail on takeoff. The commander acknowledged the report and the aircraft continued with the standard instrument departure but unpressurized and not above 6,000 feet altitude. On 22 July 2011 an Airbus A340-300 on a scheduled passenger flight from Caracas (Venezuela) to Paris CDG (France) at FL350 in night IMC encountered moderate turbulence which led to an overspeed annunciation which was followed by the aircraft abruptly pitching up and a gain of over 3000 feet in less than a minute before it was returned to the previous cruise level. There were no injuries to any of the 284 occcupants. It appears that the relief First Officer was not present in the flight deck during the event. This A380 suffered an uncontained engine failure on 4 November 2010 and made an emergency landing at Singapore Changi Airport. The failure was the first of its kind for the Airbus A380. On inspection it was found that a turbine disc in the aircraft's No.2 Rolls-Royce Trent 900 engine (on the port side nearest the fuselage) had disintegrated. The aircraft had also suffered damage to the nacelle, wing, fuel system, landing gear, flight controls, the controls for engine No.1 and an undetected fire in the left inner wing fuel tank that eventually self-extinguished. The failure was determined to have been caused by the breaking of a stub oil pipe which had been manufactured improperly.